I work on Alcatraz Island. The ferry ride to and from work is a beautiful one. The oil from the Cosco Busan spill no longer fills the water in every direction, though the south side of Alcatraz still reeks of diesel fuel. News of the disaster no longer dominates the front page of the paper. As the days go by, the most vivid indication of our loss is the empty sky. 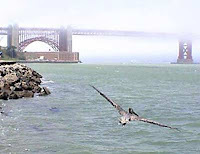 Gone are the long lines of cormorants flying fast across the bay, close to the water; gone the great squadrons of pelicans traversing the shoreline at sunset; gone the pigeon guillemots who fished the east side of Alcatraz and gone the little bird that hopped about the tide pools on the south side, whose name I had yet to learn. The gulls, so hardy and tough, are fewer, and many have oil spots on them. I will never know which of these missing birds are among the thousands who died, or the hundreds who have survived thanks to the heroic efforts of volunteers and the Oiled Wildlife Care Network. I only know that they are gone. I am writing to say goodbye. This entry was posted on Saturday, November 24th, 2007 at 4:19 pm and is filed under Uncategorized. You can follow any responses to this entry through the RSS 2.0 feed. You can skip to the end and leave a response. Pinging is currently not allowed. What a wonderful post; beautiful writing. We humans can be tragically disappointing. Please do continue your blog in some form – it is very worthwhile.